It’s the most wonderful time of the year… strawberry season! 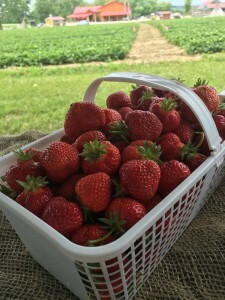 The months of June and July gift Ontario with fields full of fresh, sweet, mouth-watering strawberries- perfect for making jam, baking pies, topping cereal or just eating by the hand. It is safe to say that strawberries are loved among many, but there is more to know about these succulent berries than meets the taste buds. It is clear that us humans love to eat strawberries; however, it appears that Dinosaurs might have enjoyed them too because seeds found in Europe show that strawberries may have existed in prehistoric times! (Foodland, 2016). Although it may seem (and taste) like Ontario grows the best strawberries on Earth, the first field strawberries (known to man) were cultivated in France in the 1300’s to be used as a medicinal herb. The berry’s leaves were used to both to aid digestion and to externally treat skin blemishes and sunburns, while the fruit was used to treat discoloured teeth. (Ontario Berries, 2016) So I guess trips to the dentist weren’t always so bad, huh? 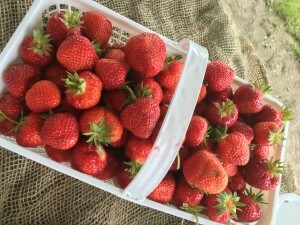 U-Pick Strawberries @ Willowtree Farm- NOW OPEN! Now that you are well informed on the goodness of strawberries, it is time to get eating- or better yet- picking! Willowtree Farm’s U-Pick Strawberry Patch is now open for business! Come stop by with your family and friends and fill a basket with your favourite, fresh and local Willowtree strawberries!